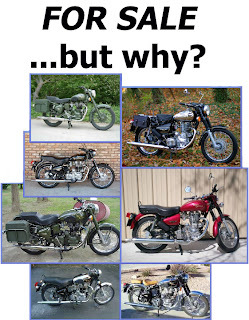 Royal Enfield guru Pete Snidal recently spotted something about the motorcycles. "I notice one thing all the Bullets for sale seem to have in common - can you guess what it is?" he wrote. I have new standard bullet which is a Big factory silencer which was given by the company, is this is better or old shorter silencer is better for the performance in millage and pick up. Short Bottle silencer is always better than the bigger one and give engine needed back pressure. Go for short bottle silencer. for thunderbird what kind of silencer suits better? on bumby roads the stock on is a nuisance to ride with. i want a stroky silencer for my new electra....plz help. and some kind of noise is comming from engine..any solution?? My grandfather..My father...and me.. now.. are die hard fans of Royal Enfield :). some say its all about Silencer and some it is the Engine...!! some say the new engine is not that great unlike the old ones... I am totally confused..
what are the modification that i should make to get the free flow of thumpimg ? hey plz guide me too for making my UCE real RE xperience...i m done 11000 kms & frst i used short bottle & now using long punjabi dholki..plz gude me..
Is Heart beat silencer is better for Std 350. Is it good to fit the Short bottle Silencer for Std 350 before 3000 as my bike has ran 2200.
let your bull complete all the services then go for a free flow short bottle silencer!!!! Which is the better silencer which makes more noise and which suits 1984 model bullet? i have 2008 RE Std 350 cc. i would like to go for short bottle but have some doubt. there is a short bottle silencer (free flow) available in local market. its totally empty from inside (free flow). is it ok to use this kind of short bottle. some people say this will damage the engine as it does'nt provide the back pressure because of free flow. Hey REBC....i hav riden old enfield...n now has a new one....bt i am not happy with the thump...can you plz tell me how can i get d loudest thump.....which exhaust should I use?? no new bullet can sound like old one ofcourse not but short bottle will help you attain almost of it..! if we put short bottle silencer after all the free services, will it affect the performance(mileage,speed...) of engine in the future in any way? I am a proud owner of a Desert Storm 500 since last 4 months and had been to places on my bullet, and covered around 3500 km, like to have a suggestion for a kind of muffler which i need to put in my bull, as the current muffler is not so comfortable esp. in terms of ground clearance, and if i change the muffler will that increase the mileage and performance or vice versa. please elaborate in detail, if possible please reply on my personal id. hey, i have a RE classic 350cc bike...which silencer is the best fit for my classic 350...????? also tell me the advantages and disadvantages of the both silencers...!!! We are authorized distributors for Goldstar silencers with conical baffles. These are the best alternative for the new royal enfields lacking the punch in their beats. It's my dream bike and soon i will be riding it. I have new std 350 april 2013 ..... 500km done.....i want full noise which exhaust should i have to use..??????? I have Bullet Electra 350cc, 2012 model. I got its silencer changed to short bottle silencer(with jaali), but I am not happy with the thump. I confused with this. Could you please suggest me which silencer should I bought for better sound and thump without affecting the engine. Plz anyone suggest me shud i go for short bottle silencer for my RE classic 500....my red machine doesn't have good thump.....and one more thing i want to ask...which silencer would be the best option for good mileage.. ???????????????.. First of all, you will have to comprehend the fact that the new UCE engines are made in compliance with modern pollution laws; both air and sound. So, however much you try, you won't get the THUMP of the ol' CI engines. Same is the case with the AVLs. Now, there are a couple of different silencers in the market. The most common are the Short bottle(Pune dholki), the punjab dholki(long bottle but free flow), and the goldstar (mostly imitations). I suggest the shortbottle. No rejetting needed REMEMBER. After that, loosen the tappets a bit (would suggest to go the mech if you are not a pro or DIY guy), and block the PAV pipe with a ball bearing. . Start the bike, let her idle for a minute or so and ride off. . You will feel a marked difference. I forgot to add, Royal Enfield doesn't make bullet anymore. They just make pulsars (or any random plastic bike) that looks like a bullet. which silencer is better for RE clasic 350? nd wil it hamper my bike performmce or mileage.,??? Nd vil hv to do any chng in engine for chnging silencer???? Nd from wer vil i get da genuine silencer?? ?